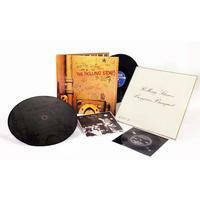 Beggars Banquet 50th Anniversary Edition! To honor its 50th anniversary, Beggars Banuqet from the Rolling Stones is getting a special edition that includes a remastered version of the album on 180-gram LP, with a 45 RPM 12-inch mono single of "Sympathy for the Devil" and a flexi-disc of a 1968 telephone interview with Mick Jagger that was conducted to promote the album for the Japanese market. The last album recorded with the original lineup of Mick Jagger, Keith Richards, Brian Jones, Bill Wyman and Charlie Watts, Beggars Banquet was recorded between March and July of 1968 at Olympic Sound Studios in London and released in December of that same year. The best known songs on the record are probably "Street Fighting Man" and "Sympathy For The Devil." For this anniversary version the album was remastered by engineer Bob Ludwig; lacquers were cut at Abbey Road Studios. Also of note in the 50th anniversary edition is the LP's cover art. When the original was released, the band had hoped to include a Michael Vosse photograph of a graffiti-strewn restroom, but it was rejected by its record label because it was considered offensive. It was replaced by a white cover with the band's and album's names written in an elegant typeface designed to resemble an invitation. As standards changed, subsequent reissues have restored the Vosse photograph. This new version features that cover, but the entire collection is housed in an overwrap featuring the "wedding invitation" image.